If you were to come to my house for dinner this week, there’s a good chance this is what I’d be serving. The boys would slurp down their food with some delighted groans, and then ask to be excused so that they could skate the new bowl in front while there was still a bit of light. 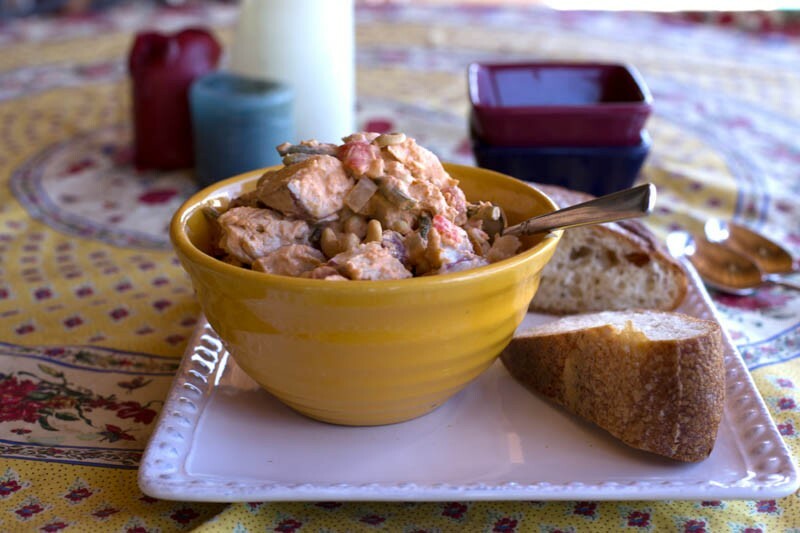 Nights on the porch with warm food and friends? One of my favorite things in the world. My Barbecue chicken salad is one of those. And our favorite Fish tacos . 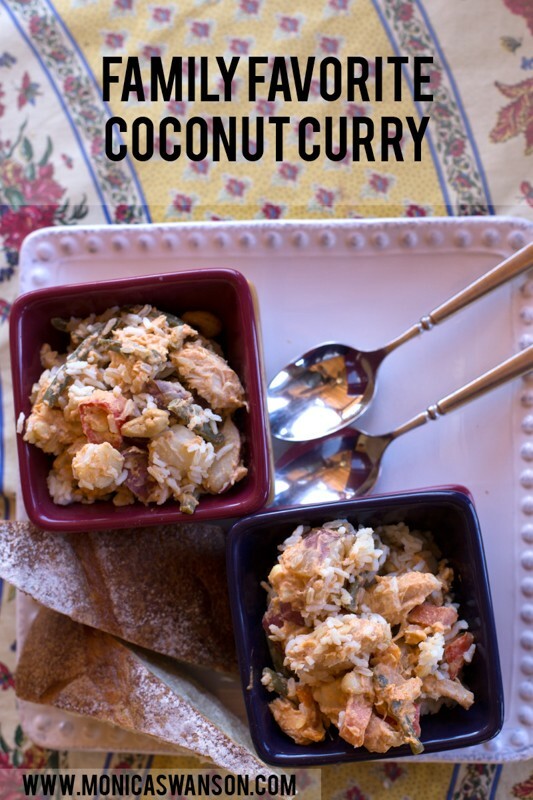 But my kids would all agree that their very favorite recipe is this Coconut Chicken Curry. 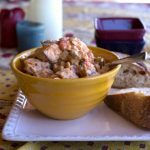 I really like to make this for guests because you can do everything ahead, and then toss it all into a crock pot and keep it on warm until you’re ready to sit down at the dinner table. That is huge for me, because when I have guests…I like to hang out. Relax. Enjoy their company and not fuss over the stove or be stressed that I might burn something while I chat. If so, then this curry should be on your go-to list as well. The smell of this curry will greet you long before you get to my kitchen. When my boys come in from an evening surf and smell this, they love me more than ever. In fact, if I could put smells in a blog post, you would all be running out to get these ingredients like now. The key ingredient of course is Thai Kitchen Red Curry Paste. I’ve never tried another brand of curry paste, but I don’t want to. Be sure to find this stuff. You can add just about anything to this recipe. I almost always use chicken (a rotisserie style chicken is pretty perfect,) but I vary the veggies depending on what I have on hand. 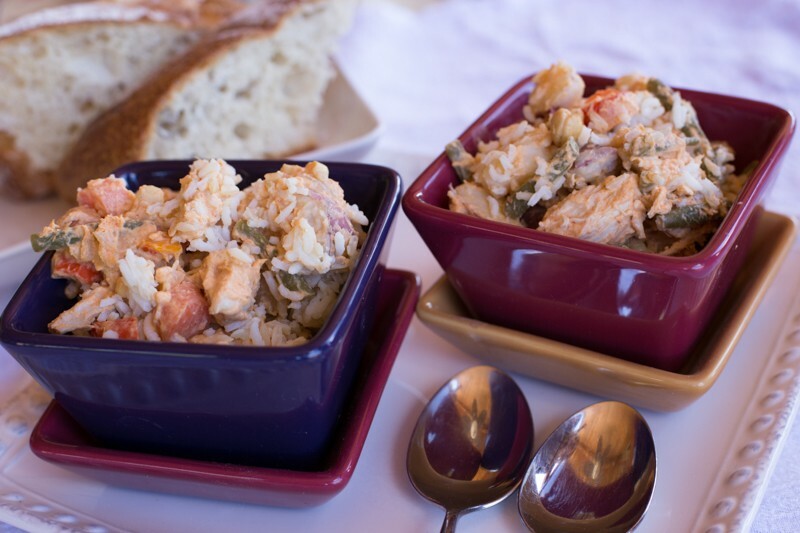 You can make it with shrimp, or go vegetarian style. 1 medium size onion chopped. 4 cups of cooked rice. Add onions, potatoes, frozen veggies, and any vegetables that need longer cooking time. Once potatoes are soft, turn heat to medium low, and add any final veggies, and chicken. Stir in the fish sauce and let simmer until veggies are cooked through. Ten to fifteen minutes. Serve curry over rice and top with cashews. What is your go-to meal when company is coming over? Has to be Chicken Gumbo. Also the most requested birthday dinner. If anyone would like the recipe I can post it. Quick question? How many servings does this make? I finally made this last night and it was a huge hit. I used shrimp instead of chicken and some leftover roasted potatoes. Soooo good! I can see how easily it could be adjusted to include what you have on hand. I wish I didn’t have other leftovers that I “have to” eat for lunch today because I’d love to have it again – but there’s always tomorrow! Your BBQ Chicken Salad is now a family favorite. Can’t wait to try this one out on everyone!! If you don’t have the recipe, let me know and I’ll send it to you. 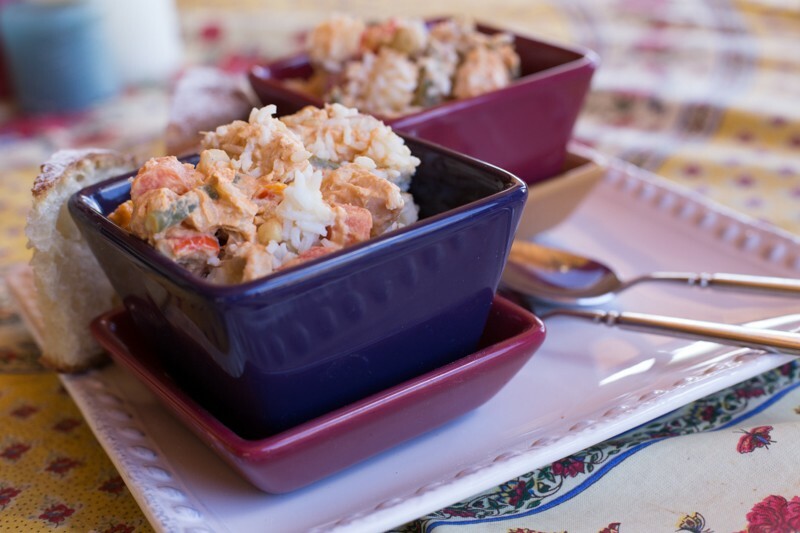 Mmmmmmmm can’t wait to try your Thai Coconut Curry Chicken 😉 one of the best things invented for the kitchen was the Crock pot <3<3 :)) whenever we are invited anywhere for a gathering, I am always asked to bring my Asian Slaw and Reese's Peanut Butter Cup Brownies…… DELISH!!!!! Oh wow!! I just made this for Valentine’s dinner–thanks, Monica!!! Hubby went back for seconds–and thirds!! Will definitely serve this one again soon!! Much appreciated!! I think I just found my Valentine’s Day dinner! YUM! Thanks for posting, Monica! I’m one of those friends you have the recipe to a few years ago and I love it. We will be making this! Looks great! This sounds absolutely amazing! I love coconut and I love curry!